The new Nook's glossy, full-color touchscreen is making a splash in the tech world today. Facts so far, according to PC World: 7 inches tall, Wifi only (no 3G), $249. 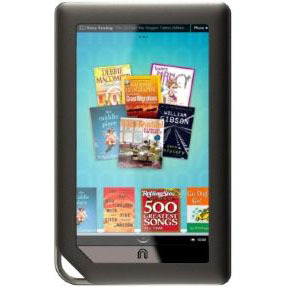 Barnes & Noble is taking pre-orders for the Nook Color now, with an expected ship date of November 19. "The move towards touch screens and apps suggests that Barnes & Noble wants to do more than sell books. Success will depend largely on whether the apps are any good, but $250 is a nice price for any multi-purpose tablet. The Kindle has third-party apps as well, but there aren't many of them, and the possibilities are limited without color and a touch screen."